Day Look: A wearable and flattering way to wear grey without loading down your eyes is to add a touch of gold in the inner corner, and to add black to the lash line. Night Look: Grey cannot go wrong paired with black. To keep things interesting, I went for a very defined shape instead of the typical smoked-out look. Read on for the step-by-step! This was a question from someone on Tumblr (i.e. 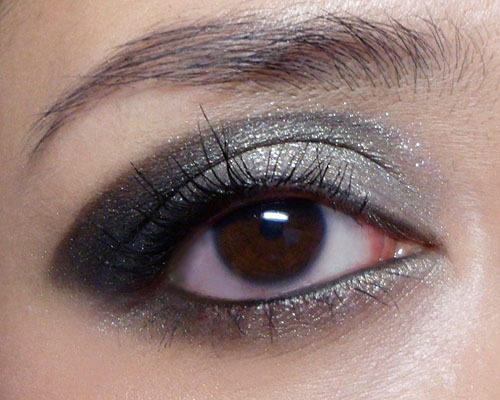 how to wear grey shadow) so I figured it would be more practical to provide both a daytime and evening option as not everyone wants to go for full-on drama. Yay!! I really like both of the looks but the first one is probably my favorite. I'm often hesitant to combine gold and silver but I love how you did it. Hi Eden, glad you liked them!! I just thought adding a touch of a soft golden tone might help to make the whole look a little more neutral for day, since not everyone looks good in pure grey.